林莉, 殷典贺, 韩丹, 侯刚, 尹燕, 康健, 王秋月. 熊果酸对香烟烟雾诱导大鼠肺气肿及氧化应激的影响[J]. 中国医科大学学报, 2018, 47(10): 876-880. LIN Li, YIN Dianhe, HAN Dan, HOU Gang, YIN Yan, KANG Jian, WANG Qiuyue. Effects of Ursolic Acid on Cigarette Smoke-induced Emphysema and Oxidative Stress in Rats[J]. Journal of China Medical University, 2018, 47(10): 876-880. Abstract: Objective To investigate the effects of ursolic acid on cigarette smoke-induced emphysema and oxidative stress in the lungs of rats. Methods Male Wistar rats were divided into the control, model, and ursolic acid groups. The pathological changes in their lung tissues were observed. The activities of the antioxidant enzymes SOD, CAT, and GSH-Px in serum were determined; the expression of 8-iso-PGF2 in serum was detected by the ELISA method. The MDA levels in the supernatant of lung tissue homogenate was detected by the TBA method. 8-OHdG expressions in lung tissue sections were determined by the IHC method. Results The lung tissues of rats in the model group showed obvious changes of emphysema. However, these changes were significantly alleviated by ursolic acid intervention. The activities of SOD, CAT, and GSH-Px in the serum of rats from the model group were significantly lower than those in the serum of rats from the control group. However, the activities of SOD, CAT, and GSH-Px were higher in the serum of rats from the ursolic acid group than those in the serum of rats from the model group. The content of 8-iso-PGF2α in rats from the model group was significantly higher; the 8-iso-PGF2α content in rats from the ursolic acid group was downregulated. In addition, ursolic acid significantly downregulated the expression of the oxidative stress indicators MDA and 8-OHdG in the lung tissues of rats from the model group. 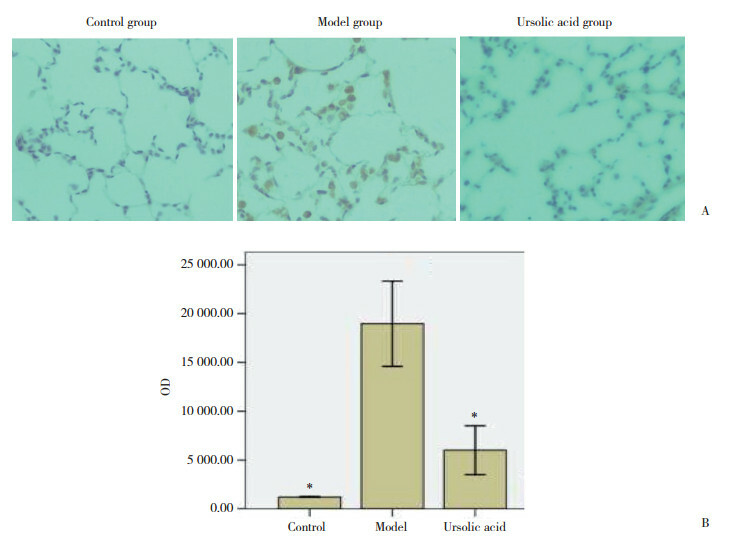 Conclusion Ursolic acid upregulates rat antioxidant enzymes and reduces oxidative stress in lung tissues, thereby alleviating cigarette smoke-induced pulmonary emphysema. Compared with model group，1）P < 0.01. MLI，mean linear intercept；MAN，mean alveolar numbers. Compared with model group，1）P < 0.05. WASEEM S, MOBARAK M, ISLAM N, et al. Comparative study of pulmonary functions and oxidative stress in smokers and non-smokers[J]. Indian J Physiol Pharmacol, 2012, 56(4): 345-352.